In a somewhat shocking scene in the second act of the play Thank You, Dad, Reverend Jim Jones blithely tosses his Bible to the ground, mocks Christ’s warning about the coming of false prophets (Mark 13, Matt 24), and then proudly proclaims: “I come in my OWN name.” Such self-deification would certainly arrest the attention of most thinking people. And yet Jones’ blasphemous arrogance was compelling enough to seduce some nine hundred men, women and children to follow him to their deaths in the greatest mass murder/suicide in modern history. Examining the toxic psychology behind Jones’ manipulative tactics could command a hefty volume, but Baltimore writer Aladrian C. Wetzel tackles the charismatic charlatan’s cunning career via Thank You, Dad – a new play being staged by Rapid Lemon Productions at the Baltimore Theatre Project. A one-man play presented in three acts by four different directors (that’s not a misprint), Thank You, Dad looks at Jones at three points in his life: his burgeoning inter-racial ministry in Indiana in the 1950s; his downward slide, when the church moved to California in the ‘60s; and his fatal final sermon in Jonestown, Guyana in 1978. How does one go from selling monkeys as a means to finance a ministry – to boldly claiming he is a god – to calmly coercing his followers to commit suicide? Largely through the gullibility of his adherents and the forcefulness of his personality. 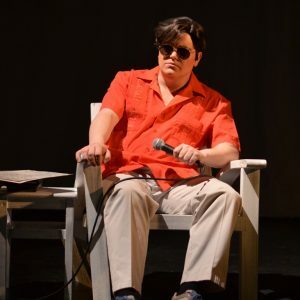 Thank You, Dad does a good job of personifying Jim Jones – thanks in part to Wetzel’s script. But the meat of this show is a truly outstanding solo performance by RLP Artistic Director, Lance Bankerd. 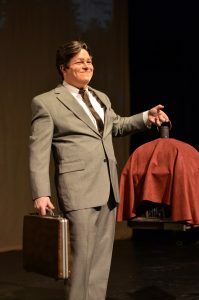 For someone who initially appears on stage wearing a wig which looks like it might have been crafted from jet-black Play-Doh – styled and set with a generous helping of Brylcreem – Bankerd toes the line of reality, yet never slips into what could come across as a cartoon characterization. A chorus of opening night giggles from some in the audience erupted numerous times during Bankerd’s performance. 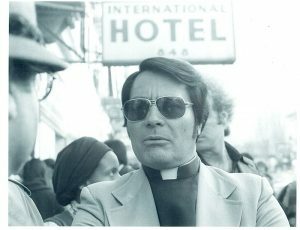 That’s a shame, because to really appreciate the devil in Jim Jones’ details, one needs to look at the man through the credulous eyes of his true believers – the flock who eagerly embraced Jones’ anti-racist socialism, while he sweetened his pot with sexual shenanigans and a mountain of ill-gotten gains. Bankerd moves convincingly as Jones, from earnestly quoting scripture, to insisting that the Bible is “a dead letter.” With hands raised, Bankerd declares, “There wasn’t any God until I came along,” and “Your universe would not run without me”. It is chilling to watch the cheerful monkey seller turn into a drugged-out dictator. Again, Bankerd’s portrayal is nearly flawless, and this in and of itself is enough to recommend this show. Bankerd’s turn as Jones notwithstanding, this production is not without its problems and may best be seen as a sober work in progress. To begin, after opening with an engaging first act, which finds Jones knocking on doors to invite people to church (and sell them a monkey), the play moves into a second act that somehow misses the mark, feels repetitive, and wears rather quickly. You know that Jones has willingly made his descent into darkness, but the inherent evil behind the sunglasses just isn’t there. In the program notes, Wetzel says she was tasked to tell Jones’ story using documents and transcripts from hundreds of recordings recovered by the FBI. Wetzel says, “real words are far more vivid and surreal than anything I could have created myself.” That’s fine and highly commendable, but for dramatic purposes, some judicial editing is definitely in order. And I offer this observation, knowing that the playwright has likely already done hours worth of cutting to Jones’ meandering sermons. The man was a megalomaniac, and taxing tirades were part of his manipulative methods. But no actor wants to see otherwise absorbed audience members periodically rolling their eyes. The third act somewhat suffers the same fate as Act Two, but with the added burden of pre-recorded dialogue addressed at Jones — exchanges that sound like unrehearsed actors reading their lines. These people are about to die. Where is their passion, remorse and confusion? It is no exaggeration to say that Bankerd’s portrayal of Jones is an absolute tour de force. Why hamstring the growing horror of the climactic moments with a series of laconic digital interjections? Why not have a sprinkling of well-rehearsed actors in the audience – not only ready with shouts of “amen” – but prepared with the heartfelt dialogue Wetzel gleaned from her extensive research? This sort of interchange with the star on stage would add an immediacy to the proceedings and help draw the audience into the action at hand – a crucial part of the play which is presently missing. A tip of the cap to Max Garner’s simple yet effective set and prop design. And kudos to Bankerd for costuming and makeup. Both absolutely hit the mark. If you go (and again, I encourage you to do so on the strength of Bankerd’s performance) allow time to look over the lobby displays, curated by Jennifer Danielle Alexander. The gallery offers a panoramic view of Jim Jones, his church and his devoted followers. There are pictures and poems in the lobby that will break your heart – a sad reminder of what can happen when any group pours its faith into one charismatic leader. Thank You, Dad runs now – January 20, 2019. Running time is about two hours with one fifteen minute intermission. Tickets $20 cash, $21 credit/debit. Theatre Project is located at 45 W. Preston St., Baltimore, MD 21201. (410) 752-8558.